ABS-CBN Integrated News and Current Affairs’ Jeff Canoy with Canada Ambassador H.E. John AHolmes. JEFF CANOY of television network ABS-CBN’s Integrated News and Current Affairs is the 2018 Marshall McLuhan Fellow. 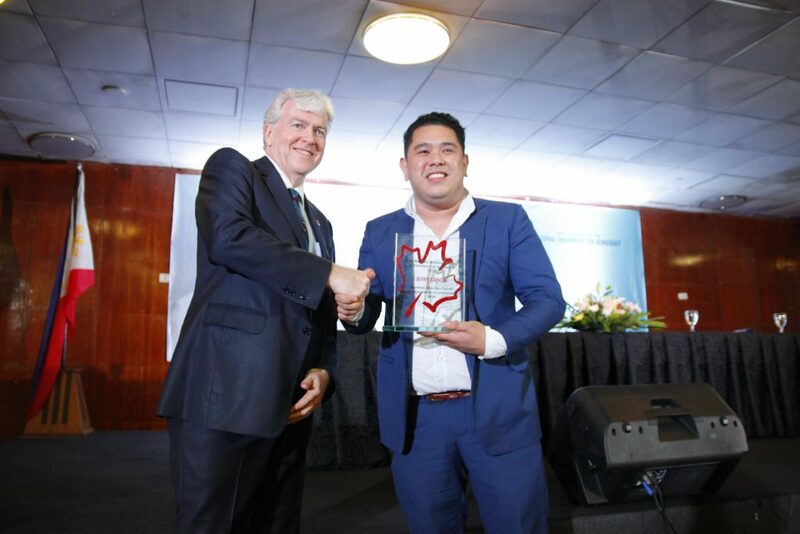 He received a glass trophy from the Embassy of Canada’s Ambassador to the Philippines John Holmes in a presentation ceremony held today at SGV Hall in the Asian Institute of Management (AIM) Conference Center in Makati City. Canoy is the 21st Marshall McLuhan Fellow. The presentation was part of this year’s Jaime V. Ongpin Journalism Seminar (JVOJS) which featured a panel of six journalists chosen on the basis of the quality of their reports in newspapers, television and online. The seminar discussed the coverage of various issues that the nation faced in the past including the Marawi siege and its aftermath, state-sponsored propaganda, China’s occupation of the West Philippine Sea, and the shut-down of the island resort of Boracay. The Embassy of Canada has sponsored the fellowship, named after Canadian communication theoretician Marshall McLuhan, for 22 years. It consists of a two-week familiarization and lecture tour of Canadian media and academic organizations, and later, a lecture tour of Philippine universities under Embassy auspices and with the support of SunLife Financial Inc. The Marshall McLuhan Fellowship was first awarded in 1997. Twenty-one journalists had been named as Fellows since, among them Sheila S. Coronel of Columbia University’s Journalism School and Stabile Center for Investigative Journalism; Yvonne T. Chua of VERA Files; Ed Lingao of TV5; Carolyn O. Arguillas of MindaNews; and Cheche Lazaro of ProbeTV. Each of the panelists received a certificate of recognition and a P 20,000.00 honorarium. These journalists join the roster of Jaime V. Ongpin Journalism Fellows, a community of journalists and media practitioners who are invited to participate in CMFR’s events and programs as well as those organized by the Southeast Asian Press Alliance, a regional network of which CMFR is a founding member.